If you have any questions or suggestions you are welcome to join our forum discussion about Breakout Pullbacks. Every time when the market breaks out through a certain resistance or support level, there will be a pullback sooner or later. If the price returns to a few pips of the entry point and tests it, this is called a breakout test. The test can happen as soon as the next bar after the breakout, more than 10 bars later, or there can even be several tests of that level. Breakout tests are important because they provide traders with a relatively reliable entry signal when the test is successful and the trend resumes (a breakout pullback is confirmed). Basically, when the price breaks out of a trading range, but fails to retain its momentum and later reenters the trading range, it’s called a false breakout (failed breakout, or fakeout). If, however, there is a pullback to the breakout (the price halts around the breakout point, instead of entering the trading range again) and the breakout level test is successful (the price rebounds back and resumes the trend, instead of reentering the trading range), the failed breakout is said to have failed, i.e. it is a Failed Failure, or it has become successful. Some traders also refer to this scenario as a Cup and Handle pattern. Here is an example of one. 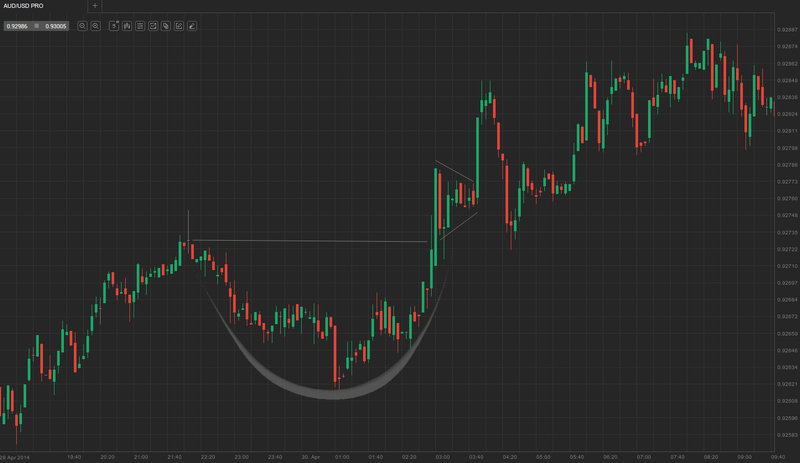 On the screenshot above you can see a typical cup and handle pattern. The price earlier broke out to a new session high, after which a parabolic-like pullback followed. The pullback ended with a breakout to a new session high, which itself pulled back in the next two bars, giving a second entry signal and forming the so-called handle. The handle itself was an expanding triangle which, as expected due to the strong trend day, broke out in the with-trend direction. Later it pulled back to again test the cup’s breakout level and continued up. Where these market moves derive their trading value from is that they are second entry signals (at the pullback test), and second entries have a greater chance of setting up profitable trades. Sometimes you don’t need an actual breakout to occur in order to have a breakout pullback signal triggered. If for example the market reaches a previous extreme, but it doesn’t break it (doesn’t penetrate the support/resistance level of that extreme), the price will often pull back, just like if there was an actual breakout and it should be traded the same way. Usually, if there had previously been a strong trend, which entered a trading range at some point, a with-trend breakout from that trading range has a better chance to be successful than a counter-trend one. Conversely, if most of the trading session has seen two-sided trading, then a counter-trend breakout from the trading range is more likely to occur. Often, the price pulls back to the exact breakout point, and so traders who had previously entered a position on the breakout might get their stops hit, if they are not placed well. As the breakout occurs, many traders enter positions in the breakout’s direction and after the initial run, they take partial profits and leave the other part of that position on the market, using a stop-loss. Let’s say we have an upward breakout. Typically, because the breakout point creates a support level for when the market pulls back, one would want to place his protection stop beneath that support level, so that it does not get hit by the test itself. Its goal is to protect the remaining portion of the trader’s position, if the test fails and the price reenters the trading range. Some market players place break-even stops, but risking a bit more (widening the stop) might in many cases yield better results, because it lowers the chance of the breakout test, or some random noise, hitting your stop before the price edges back higher. 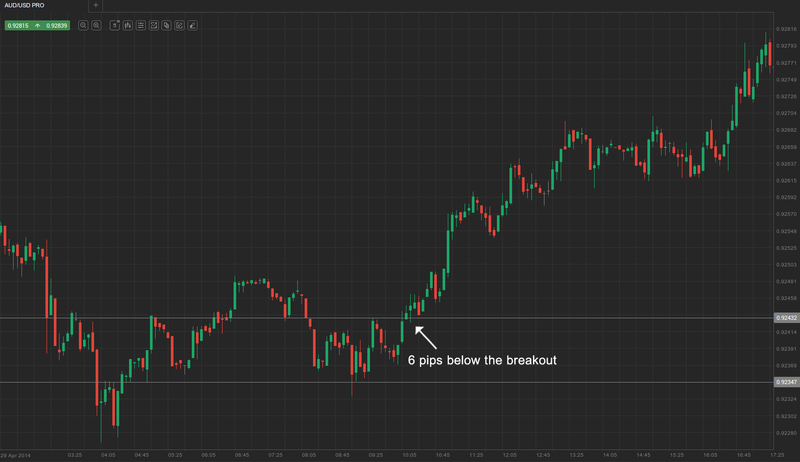 It is often seen that the breakout test extends 5-10 pips beyond the breakout point, triggering many breakeven and tight stops along the way, before it finally forms a breakout pullback. In some cases therefore, risking a bit more with a wider stop could come in handy. As you can see on the screenshot above, the market entered a trading range as a part of a pullback from a previous rally. After it broke through the top of the range, traders would expect the previous uptrend to continue and would likely go long above the high of the first bar that closes above the trading range. However, the market pulled back and tested the breakout level, and because the pullback extended several pips beyond the breakout level, traders who had placed a protective stop exactly at the breakout level would have been thrown off the market at a loss.